…and so, just like that, the blockbuster exhibition of the year is upon us! The National Gallery Singapore (NGS) has given us a little taste of Yayoi Kusama’s Obliteration Room in its Children’s Biennale (see our take on it here), but by the end of this week, be prepared to face the full onslaught of Kusama’s mad genius in Singapore’s biggest national art space. It’s her first major show in Southeast Asia and we’ll be frank, we were pretty blown away. 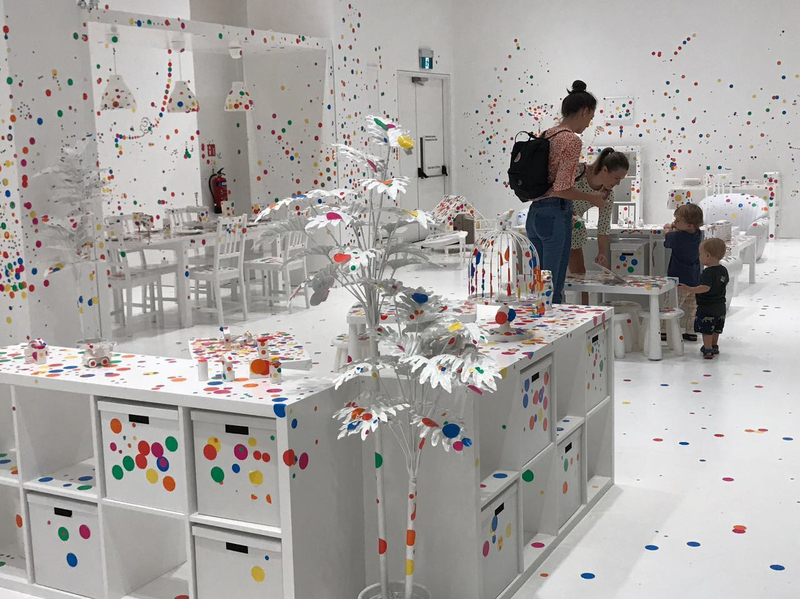 The Obliteration Room – Participants in the installation are required to paste polka dot stickers all over a white room, in order to “obliterate” the existing surfaces. 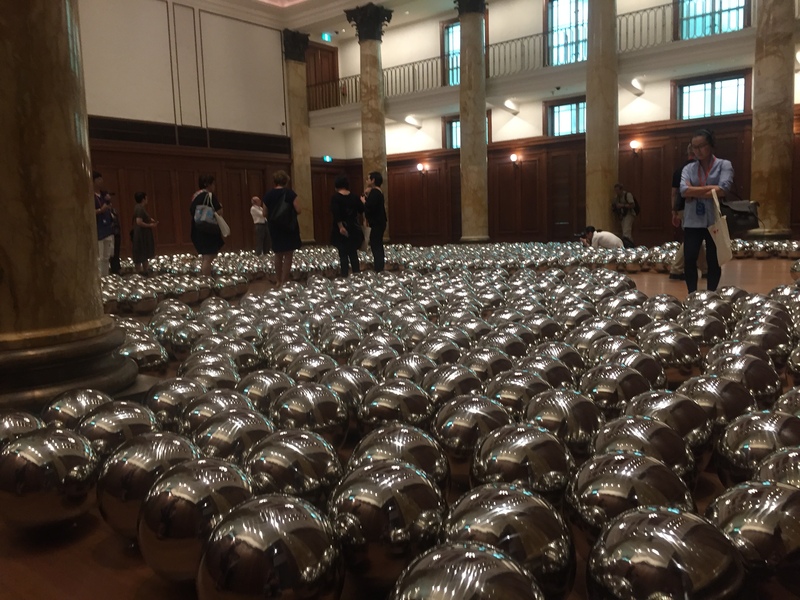 If Kusama’s shows overseas are anything to go by, massive crowds are to be expected. At the grand old age of 88, Kusama’s exhibitions are still touring the world, and her works have sold for record-breaking amounts of money. The theme of mirrors and reflection has certainly been a recurrent one in major art shows this year – the recently concluded Singapore Biennale, for example was entitled An Atlas of Mirrors. The idea of mirrors replicating both ugliness and beauty, and trapping a version of oneself within a boundless space, provides much room for reflection (no pun!). No doubt this is a beautiful work to plaster all over one’s Instagram feed, but we’d urge you to also consider the less obvious nuances – that overwhelming beauty can sometimes be sinister, and that an endlessness of possibilities sometimes creates a countervailing loss in direction. To provide some context to the popularity of these works, 14,000 visitors thronged the opening week of Kusama’s exhibition on infinity rooms in Washington, earlier this year. If that alone doesn’t convince you to pop down to the NGS , we’re not sure what will. The models looked diseased; obliterated it seems, into both Kusama’s imagination and our reality, where colored circles on skin connote clown-like humor, but also illness and plague. Consider also Kusama’s position as the fully – clothed female artist, directing the proceedings as well as the objectifying gaze of the audience to both her male and female models. These are empowering images from both a feminist and minority perspective, manifesting madness, delight, freedom, insubordination and corruptive rot, all at the same time. We always love it when defiant works such as these are displayed within the NGS, the location of the former Supreme Court of Singapore, a site which itself epitomises law and order. It reminds us of the fact that histories are written by winners, and that a multiplicity of viewpoints exist, with regard to any important event. She was eventually stopped for unauthorised hawking, but the work remained in place. By 1993, having achieved commercial acclaim, Kusama was invited back to the Venice Biennale to hold a solo presentation in the Japanese Pavillion. And really, if you don’t care for all that arty-farty analysis, they are a bunch of lovely, shiny bits and bobs, prettily scattered all over a gorgeous colonial room. Check out Phallic Girl (1967), which is a mannequin painted in silver and studded with flaccid phalli (try saying that 20 times, fast!). We weren’t allowed to photograph the work in the NGS due to copyright issues, but you can see what it looks like here. The body here is parasitically overtaken by symbols of masculinity and Kusama attempts to “control her phobia” by “compulsively repeating its form.” It’s a disturbing scene, the sight of this female body studded with barnacle-like stuffed penises. Note of course, that in Phallic Girl, male appendages strategically cover the nakedness of the female form such that she is rendered presentable and decent enough for public consumption. They cover and consume her, but are ultimately weak representations of true masculine energy. Anyone out there ever been subject to mansplaining? The term may have been coined only recently, but we think Phallic Girl, is a great physical representation of the concept! For Yayoi Kusama, the pumpkin represents “comfort and security” as her family owned a nursery and grew fields of pumpkins and flowers. (We do wonder however, how this association squares off with her troubled parental relationships). She’s claimed that the pumpkins’ “generous unpretentiousness” and “solid spiritual balance” appeal to her. This exhibition sees a new pumpkin infinity room surrounded by a yellow-and-black dot motif, together with paintings of pumpkins, and large mosaic-tiled sculptures of the vegetable. Pro tip: one of the gallery assistants who mans this room, is an actual photographer. If you say hello, he might give you suggestions on how best to pose! Pumpkins themselves are such evocative objects in pop cultural terms, being equally suggestive of princessy Cinderella- type carriages, as of the antics of say, Billy Corgan and gang. Indeed, the social media- friendliness of Kusama’s work has gone so far as to illicit Smashing Pumpkins of an altogether different kind! We imagine in the coming weeks that your social media streams are going to be flooded with images of these whimsical, fun works. 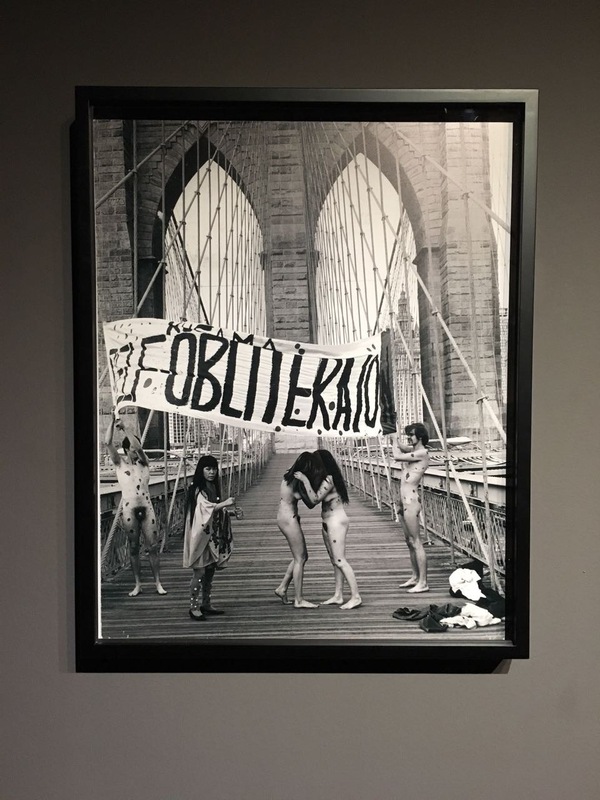 Don’t get us wrong, we love that the pieces on display are pretty enough to spice up the blandest Instagram feeds, and we urge you all to go take a look at the show for precisely that reason. The show runs from 9 June to 3 September 2017, and the works are accessible, iconic and engaging. While you’re there though, try to pause for a minute and think about the Inimitable Ms Kusama – a long-time mental patient who escaped an abusive and restrictive Asian household and society in order to challenge the boundaries of art and gender in the 1960s, in shocking and taboo ways – and consider then, whether any of that speaks to you as well. If you’d like to hear about some of these works from the great lady herself, check out this short BBC interview. (Added bonus for those of us of a certain vintage: it features comments from the very excellent Peter Gabriel).